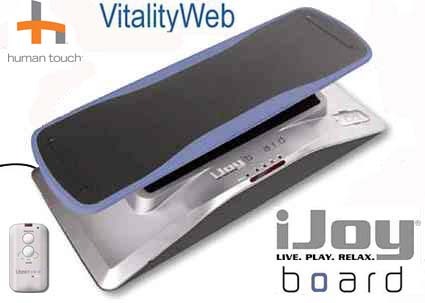 iJoy Exercise Board balance trainer by Interactive Health. No matter the season, no matter the board sport, the motorized iJoy® Board balance trainer keeps your legs fresh, toned and ready to carve the slopes, grind a rail or catch a wave. 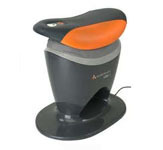 Just hop on and press a button on the infrared wireless remote control and experience the simulated motion of a snowboard, skateboard or surfboard in action. By maintaining your board stance on the unique non-slip platform, you increase your core balance and coordination skills, while sculpting the specific muscles you need to excel at any board sport. Test your skills by varying the speed of the iJoy® Board – slow, medium or fast – or choose the 15-minute program that intermittently varies the board’s speed. Features an automatic shutoff after 15 minutes of activity. Have fun while exercising with this unique balance-training device. Practice your favorite board sport (skate, snow, surf) in the comfort of your home. Increase core balance and improve coordination skills. 1 program – varied speeds that lasts for 15 minutes. 3 speeds – slow, medium and fast. Automatic timer shut off after 15 minutes. Product Measurement in inches: 30" x 10" x 14"